With the blood of cartoonists still fresh on the walls of Charlie Hebdo in France, I thought I’d move up the announcement that poison pen-man Ted Rall has been named a Fellow of the Palast Investigative Fund. Now you can sign up to receive Ted’s ”˜toons and tales weekly, no charge. Why the heck does an investigative reporting team need a guy who draws the funnies? Ted is, in fact, one of the USA’s top journalists””reporting from Afghanistan (“After We Kill You, We Will Welcome You Back as Honored Guests”) and the other places too scary to go to yourself””and from the belly of the New York beast. The fact that Rall’s reports often come out as punch-lines in word balloons just makes his work even more brilliant. Download one of Ted’s masterpieces, “To Afghanistan and Back,” for FREE. We are honored to give Rall more opportunities to put himself in danger. Hey, that makes him a perfect candidate for the Palast team. It’s an unusual fellowship: As our fund is skint, we are granting him an award of exactly Zero dollars””though my daughter will make up a nice card. What we have offered instead, is a chance for him to give you his columns for free””and to give away one of his books. But while you’re scarfing up the freebies, I’m asking you to make a tax-deductible donation to the Fund. Every dime and dollar collected on that page goes to Ted’s work. And Ted will send a signed copy of his to-die-for books of cartoons and reportage in thanks. Instead, cartoonists, even one’s of Rall’s international stature, get paid at sweatshop piece-work rates. He’d be better off sewing sneakers for Nike. 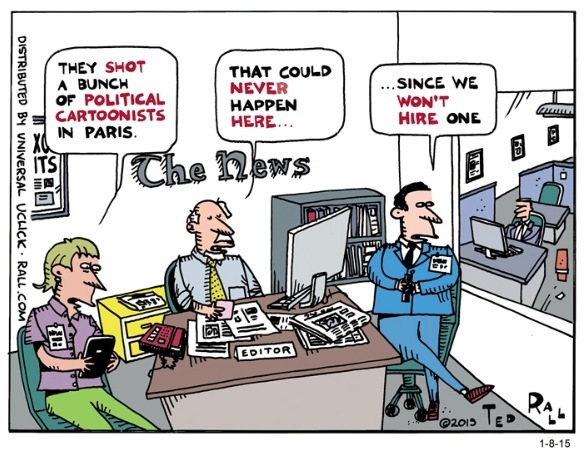 Ted Rall’s pen is mightier than (most) swords. Help us keep it loaded. Sign up””and donate now.